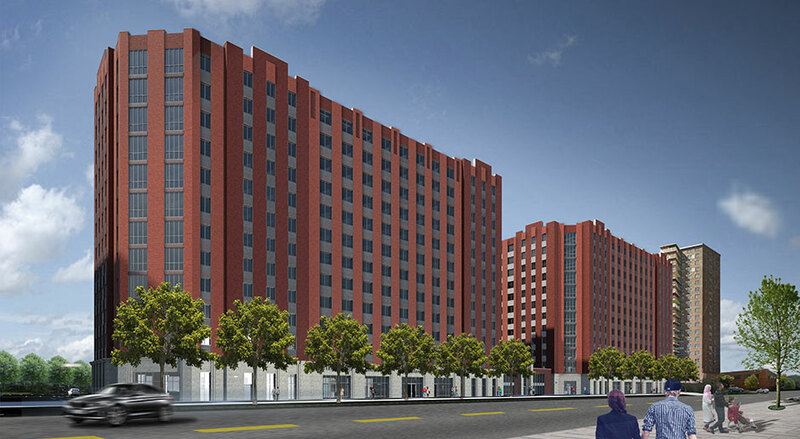 Story Avenue East is the first phase of a mixed-use project developed by affiliates of Nelson Management Group and L+M Development Partners in the Soundview neighborhood of the Bronx. Located on the northern end of the existing Lafayette-Boynton residential complex, which contains four former Mitchell-Lama towers, the project will reconfigure the existing parking infrastructure and landscaping to create a 240,000 SF building with 212 affordable units and 7,500 SF of community facility space. Half of the units will be affordable to low-income households at 57% of AMI, and the other half will be affordable to moderate income households at 80% to 95% of AMI. Numerous improvements will be made for the benefit of both new and existing residents, including a fitness center, children’s playground, outdoor fitness area, community gardens and central greenways with seating and walking paths for residents of all ages. Story Avenue East is expected to be complete in late 2019. Story Avenue West is comprised of 223 mixed-income units and offers several amenities including proximity to 205 acres of green space. The building at 1530 Story Avenue has 211 affordable apartments and features a mix of studios through three-bedrooms. A Soundview native is helping her fellow community members get jobs at L+M's Story Avenue project.